For those of you who like bugs ...Mike Libby is simply fantastic. Yes, these are all mine. I won five beverage bags at the CNCH charity auction. I came in on Sunday morning to find all five of them sitting at my spot in my tapestry workshop. What a pleasant surprise. 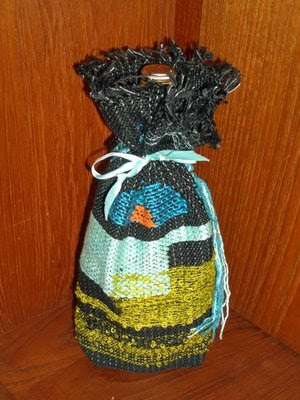 I had tried to win back the beverage bag I made but it went to another lucky raffle winner. There seemed to be hundreds of beverage bags in the raffle...all different...all quite creative. 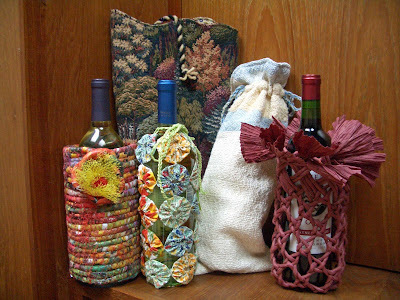 I have a jacquard one by Sheila O'Hara, a lovely twill by Judy Calder, a beverage bag made of paper rush done in plaiting wih a twist by L. Oller and a really fun one made of yo-yo's by Kay Tirsheck. My favorite is the one on the left - by Jan Muts called 'Revamped' - created by recycling old calendars, an empty cannister and fruit netting. I need to bring a beverage bag for the upcoming CNCH meeting. Here is what I came up using my sampler from a Theo Moorman workshop I took. They are to be auctioned off for some charity...I think I'll put a real bottle of wine in it vs. leaving it empty or using the cranberry juice bottle as pictured in the photo. Here's a photo of my first beetle on the new warp. It's a kind of shake down cruise. I find every warp is a bit different. And this one is no different. The legs of the Pachyeteria dimidiata beetle are a bit elongated due to soft beating which I eventually corrected. I need each piece to be at least 10 inches long...11 would be better...12 is a bit too long. My technique is to measure before I advance the warp and project how long the piece will be....and adjust my beat accordingly. I will probably have to do a few more beetles before I can stop measuring so often. 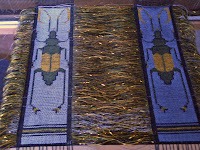 I'm off weaving a beetle...life is good. The loom is already for weaving. Just need to review my designs, select some colors and away I go. As you can see, I have two warps so I will get two of everything thing I weave. I will be using two colors which will be common to both pieces and the closure weft color will vary. The pieces will have fringe on both sides so I need a closure weft to keep the warps from shifting around. 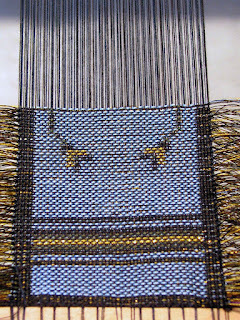 The closure weft turns on the last warp vs. on the supplementary warp on each side. There is about 9 yards of warp so this will be quite a production line. I expect this will take perhaps three months to get through. So far I only have one or two designs completed so there will be a lot of designing also. 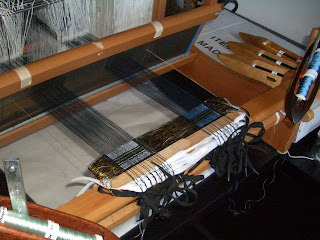 The process of rolling on the warp was not the best nor the worst experience I have had. Both the first and second warps rolled on at the same time. Most of the problems were in the first, probably before I found my threading process. I take awhile to figure out the best method for threading. Although I always go front to back with sewing thread, it seems each time I warp I do things just a little bit different. Probably depends on where I put the loom, what shoes I am wearing, how I feel and perhaps if its Tuesday. That warp did stay very neat in that metal contraption. However, going through the reed and heddles did not provide enough tension to keep things straight. It usually does on thicker warp. 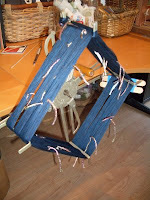 I kept the leash [popsicle] sticks on the second warp taped to the loom which provided enough tension for that warp. The other warp got a bit twisted. And once there is a twist...it is there for the rest of the warp. Next time I will try to remember to keep them on for both warps. Now off to the dentist...and then I can design.